Canadian singer Christo Graham has turned the water of one of Andrew Lloyd Webber’s most beloved musicals into the wine of glorious, everlasting parody, recasting Webber’s musical life of Christ with an all-felt cast with Muppet Christ Superstar. 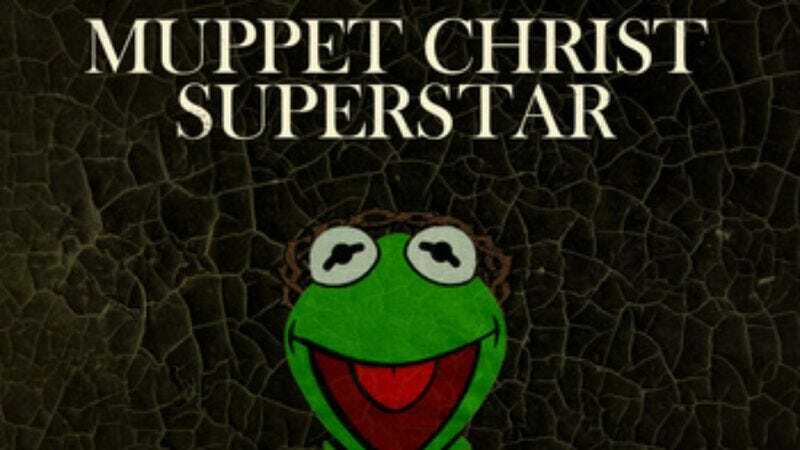 Casting Kermit as the Messiah, Gonzo as Judas Iscariot, and Miss Piggy as Mary Magdalene, Graham has re-recorded all the musical numbers from Jesus Christ Superstar. He also does fairly good impressions of all the various Muppets, including backup vocals from the Electric Mayhem, Beaker, and Gonzo’s chickens. Apart from the fact that they’re sung as Muppets, the songs are more or less faithful—and also apart from a few lyrical changes. For example, Piggy sings, “He’s a frog… he’s just a frog…” in “I Don’t Know How To Love Him,” while Gonzo asks what happens “If you strip away the myth from the frog” on “Heaven On Their Minds.” For those of you who have been waiting and hoping for the religious-themed Muppet musical that never was, your prayers have finally been answered.